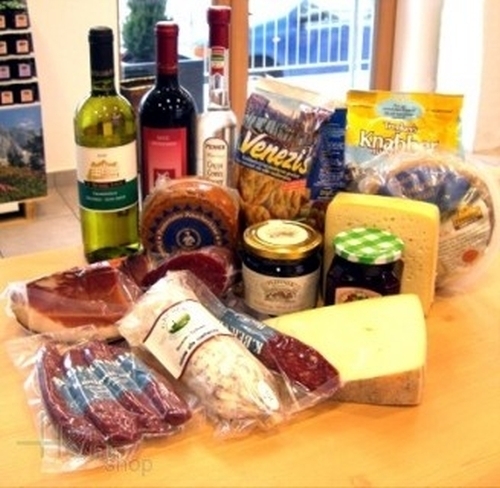 Surprise your friends, relatives, known with the tastiest assortment of products of Alto Adige of incredible quality without forgetting to delight, nevertheless, first of all You yourselves. about 500 gr. Cheese to the Bar Dobbiaco of the dairy Three Peaks of Dobbiaco. 200 gr. Bread of ryes Venezì s Trenker, variation of the traditional one Schüttelbrot made rich with Mediterranean spices. If you want to add other specialities, do not hesitate to contact us for all the information whom you will need. We will be glad of giving advice and of granting Your wishes. The single cheese pieces are cut fresh to the moment of Your order and places under vacuum in the way of guaranteeing a conservation of several weeks (up to seven weeks) and their integrity during the transport.